There are so many things that could be my inspiration to write an article or a short devotional. 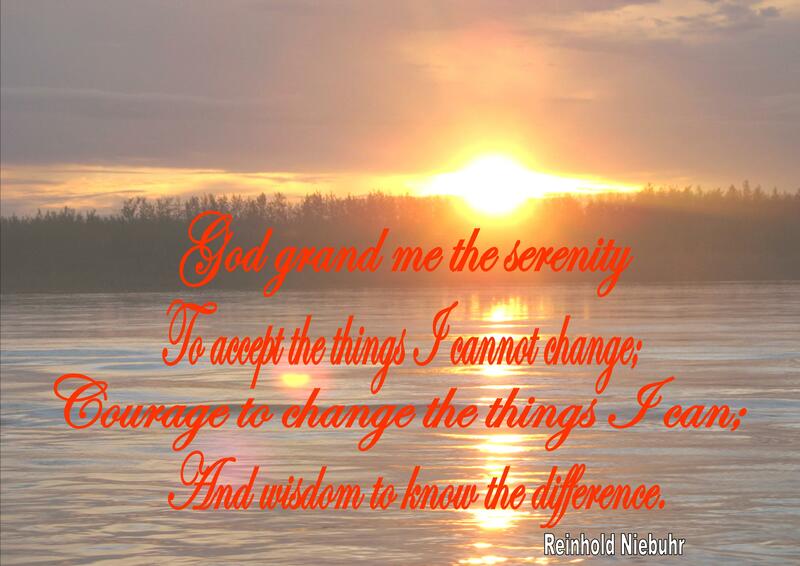 This evening my post was inspired by one of my friend who asked me to pray his problem. He has a problem with temptation. But perhaps for some reason he did not tells the details of what kind of temptation that he faced. Now I would like to write a bit of my thought about this matter. As a human we are born with a sinful nature from the fall of Adam. 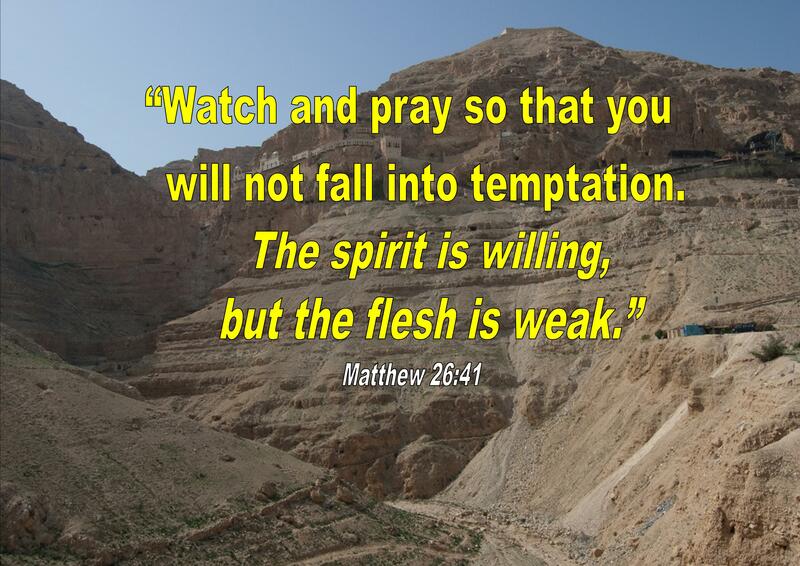 In our daily lives we will be faced with any temptation which could bring us into the sin. One important thing that we have to realize is temptation not come from God. It comes from Satan! Satan brought it into our life. As we know Satan always works hard, continuing to try with many ways to make our fait fall. Moreover, temptation came from the flesh (Old sinful nature) and from the world who would like nothing more than to see a Christian be disobedient. It is important for us to be on guard in our lives for our own protection. Sin is disobedience and God hates sin. We have to choice of whether to take the means of escape or to allow the sin to enter into our life. When we find that we are tempted by something immediately consider our means to run away from the temptation. For simple examples, if it is something we are watching on television, we can turn of the television off or we can change to the other channel which couldn’t bring us to be tempted. If we have problem with gambling, don’t go to places that provides a means of gambling. For those that are tempted by alcohol, please do not spend time in a club or bar. I said to my friend the point is not only how many friends who praying for him but the truly point is we should take measures to protect us and keep our distance from everything that could bring temptation. This is about how we endure to face any kind of temptation. We need to remain accountable to God for our actions. My dear lovely readers, I am totally realized that it is not as easy as turning the palm of our hand. But God gave us the advice to be able to overcome our flesh: “But you, dear friends, by building yourselves up in your most holy faith and praying in the Holy Spirit, keep yourselves in God’s love as you wait for the mercy of our Lord Jesus Christ to bring you to eternal life” (Jude 1:20-21) Establish ourselves with a solid foundation, on the basis of faith, praying in the Holy Spirit and continue to diligently maintain ourselves. God knows our primarily problem. Even though our spirits are born again, but our fleshly desires is also not less powerful and trained to always tend to return us to the passions and desires which would dropped us back into sin. We are awarded a Counselor; the Holy Spirit can guide our spirits to be in power within us than our flesh. Is there a sin that seems to have a strong hold in our life? Think about the ways in which we could make changes to reduce the possibility of being tempted by that sin. Go to God in prayer today asking forgiveness for any sin we have committed while asking him to help us to keep from all temptation. Also ask to God to us to build a firm foundation. Spend time with Him and with His word. A good Spiritual foundation can give us the tools to keep us from temptation and sin. Amen. Many thanks to sister in Christ Shelly http://sssorem.wordpress.com for your lovely sugestion on my post. My mind drifted away. 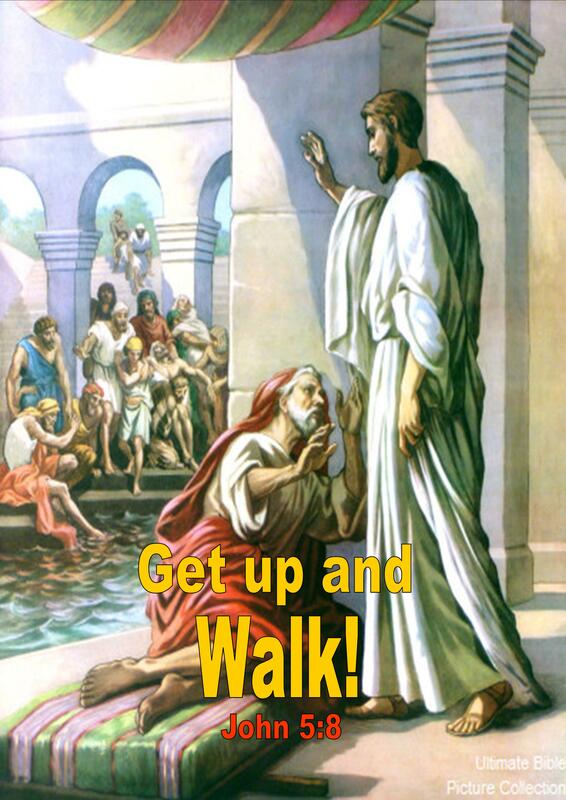 I am reminded of a story in the Bible about a paralyzed man at the pool of Bethesda. He was paralyzed for 38 years. This story is an example of someone who expects a miracle happens to him but bases his faith only to the humans. When Jesus asked him if he wanted to get well, he replied: “Sir, I have no one to help me into the pool when the water is stirred. While I am trying to get in someone else goes down ahead to me.”(John 5:7) He expecting a miracle but only relies on human aid. This is what I mean by put our faith at the wrong base. This often happens in the Christians lives. We often expect miracles happen but we let out our faith just lying on the wrong thought. Moreover, we don’t know how to build the true faith and don’t know how it works. So we look God’s miracle seems as a thing that so hard to reach. In fact, God’s miracle only base on one word “Only in You” When we need help people can fulfill it but when we need miracles, only God alone that can do it. This paralyzed man hoping a miracle happens to him but year after year he only focused on people who passing in the front of him. How often we spend our time to knock our fellow’s door? How often we spend our time to knock God’s door heart and express our powerlessness? This is the key to present miracles in our life. Miracles will not come from our friends, neighbors, or others but only from God alone. This post was inspired by my friend who shared her problem. She has a problem to forgive her boyfriend who has been hurt her heart. I am interested to post this article because forgiving is often times be a difficult thing to do in our lives. Hopefully this article can be useful for many people who has same problem with my friend. When we repented of our sin and asked for God to forgive us, He forgave us for all of our sins in the past and any we would commit in the future. It did not matter what sins we committed in our life. God was willing to forgive us. He knew our heart than we had a genuine sorrow for our sin. There was only one perfect person, Jesus Christ. We are not perfect and sometimes people say things of do things to us that can cause hurt or anger. We have to remember that the other person is not perfect either. Whether they meant to do the things they did or said does not matter. They may not see that they have done something wrong. If the person is another Christian we are directed to speak to them to let them know that we were offended or hurt by their actions (Matthew 18:15-17). If they do not listen we are to go to the person again with other Christians. After that point we are to go to the pastor of our church. God tells us that if they still do not hear then we are to let them be as ‘an heathen man’. We still have to forgive them for their actions. What about the lost person that falsely accuses us, persecutes us, or commits some wrong against us? We need to look at the person through the eyes of God. They need Christ just like we did. On the cross Jesus made a request of God concerning His persecutors, “Father, forgive them; for they know not what they do” (Luke 23:24). They do not understand the impact of their action and do not realize what they are doing is wrong in the eyes of God. We have to forgive them. Forgiveness is not initially about the person who wronged us; it’s about us. If we will not forgive someone who has hurt us, we start to change on the inside. We grow in anger and resentment. The quality of our own life continuously suffers and in this way, we compound the wrongdoing until it becomes something far more damaging than it originally was. One of the most important reasons we must forgive is that we cannot grow into the mature Christian whom Jesus is calling us to be with all that hurt and animosity building up inside us. Forgiveness is that act by which we release ourselves from our own prison of bitterness. I know and realize that forgiving those who have hurt us is not an easy thing. But let’s we ponder this; God tells us that if we do not forgive that He will not forgive us . As a Christian this means that our prayer will be hindered. If this time we are struggling to forgive someone who has hurt us, do not rely on our own strength. Remember we are not the perfect person. 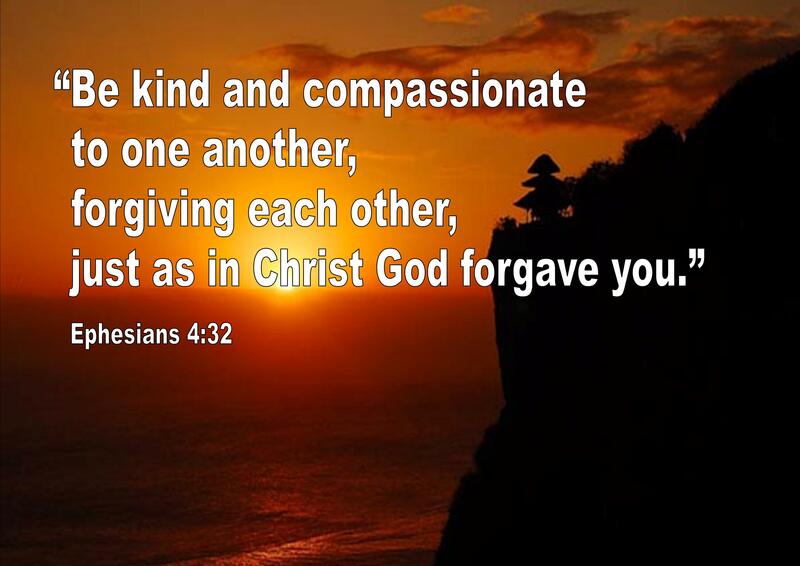 Ask for God to help us so that we are able to forgive someone. God can give us the strength and understanding we need to forgive so that we can grow closer to the Lord. More than that, we have to pray for the people who have hurt us so that they are aware that they have done wrong to us. Forgiveness is about how we respond. If we follow Christ’s pattern, we still love the person who offended us, even to the point of death. That is love. Love and forgiveness go together. My dear friends, what about us? whether we still have the spirit to forgiving? Are we still hard to forgive someone and still would not give forgiveness to everyone who has hurt us? If we realize that they are imperfect people like us who one day might also be able to hurt others? Once again, let’s we ponder this verse: “But if you do not forgive, neither will your Father in heaven forgive your trespasses.” Amen. Thank you to my sister in Christ Julie http://followhislight.wordpress.com for your awesome suggestion on this post. Nearly every day I always received many email from my friends. Not a bit from some persons who I don’t know before. Most of them share about their problems or just ask me to pray about everything they need. I always excited to read their email because from their story I always learned so many things for my own goodness and for my spiritual growth as well. I am trying to respond her question based on the verse above. This verse of Psalm is a God’s promise to us. 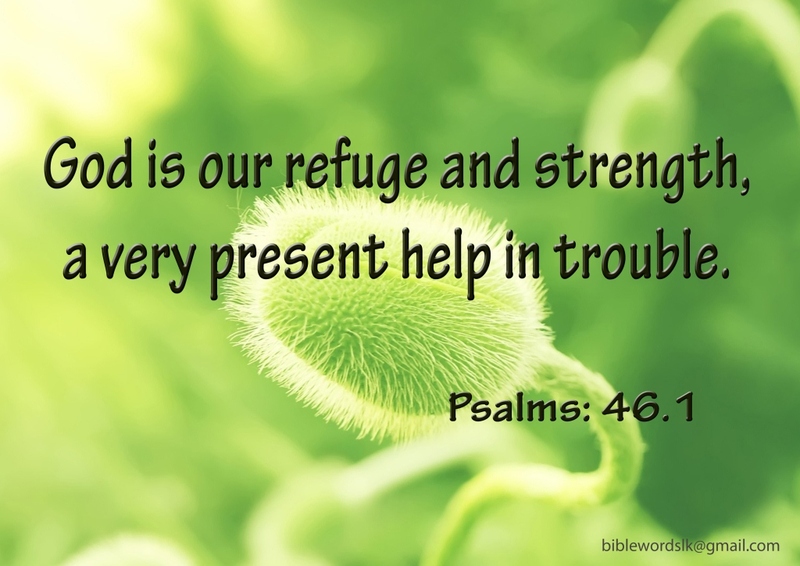 The Lord will be a refuge, a shelter, a hiding place in times of trouble. One thing we have to remember that the troubles have become a part of our lives. We cannot run and hide from troubles. The problem is, although many Christians who profess to believe in God sometimes forget that He is the source of help in the time of trouble. When we are in struggling with trials, sickness, and or losses we must be remembered that God is sovereign and He is working in our life even when we cannot understand the unfolding of his providences. When troubles comes to , for example; to a marriage, or parents are struggling with a rebellious child, or like my friend who have troubles in her job, we must remember that God’s word is our source of counsel and that God does not forsake them that seek Him. So, how to struggle with so many troubles? First, we must understand that the power of God will make us believe that nothing is too hard for God. Second, we must truly understand and believe that His merciful gives us hope to call Him in our time of need. The last, this is the important point, we must strongly understand and believe that his faithful assures us that He always keep His promises. I reaffirm one statement above that God is sovereign and He is working in our life even when we cannot understand the unfolding of his providences. God never stay silent. He knows all our troubles and he certainly proved his promises. Always directs our hearts and minds as well as get into the His presence. Put our faith on Him and trust on His word. Amen. There once was a woman on the side of the road whose vehicle had run out of gas. She had no money and needed to get home to her children. This woman did not know Christ. A born-again couple stopped to check on her. They bought a couple gallons of gas and even returned to her with food and drink since stranded. The women cried uncontrollably because no one had stopped to help her for a few hours. It was a wonderful opportunity for the Christian couple to show some charity and talk with the woman about her need for Christ. Often we may marvel at how those needs are supplied. I have seen so many people provided for when the least expected it. Meals have been brought to families in need without them asking for food. Some have received checks in the mail that they did not expect. Remarkably the check would be almost exactly the amount that was needed to pay an important bill. There are times when it may feel I like a need is not being met but the Lord already has something in place to meet our need. It is during these times that we must have faith knowing that God’s word is true. It is that same Christian charity that moves many of us to help another believer. The Holy Spirit living within us may give us a strong feeling to help another Christians. We should follow His leading because we never know what sort of a blessing we could be to that person. There are so many ways that God could supply our need. If He provides for us in unexpected ways, openly praise the working of the Lord in our life. It can be of encouragement to others or a witness to the lost. My dear brother and sister in Christ, are we fretting over a need in our life that we are uncertain how it will be met? Let’s we go to the Lord in prayer and ask Him to provide for that need. 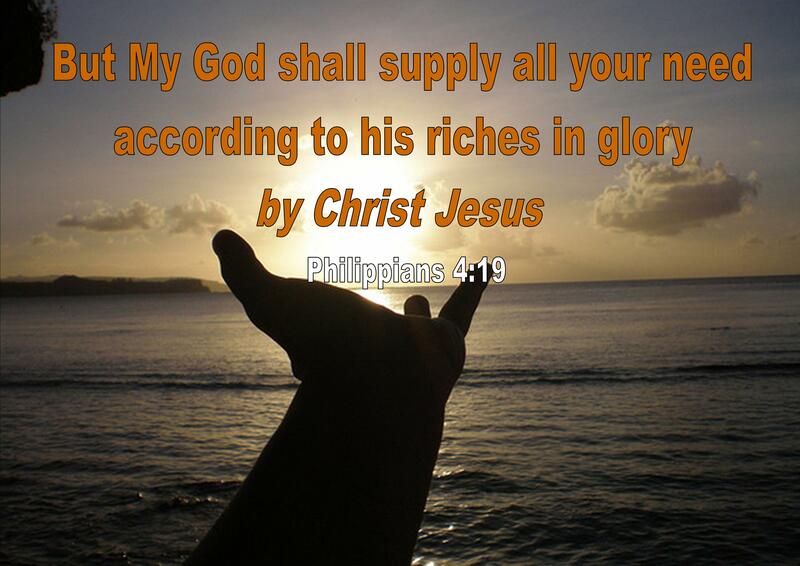 Take comfort in knowing that He said will supply all our need. Amen. “I don’t how long I must waiting for the God’s answer. I think God is too long to respond or perhaps even He did not respond to my prayer. I am getting impatient” This remark came out from my friend who was having problems in her work. Few days ago she came to my office to ask an advice. This is a problem that often occurs in many Christians including me sometimes. The reason that we many times do not see or feel the Lord presence is that we are not waiting for the lord. We are still on our own timetable and we are still running madly ahead of God and hoping He will catch up to our plans. But that is not how God works. He doesn’t change just because we are fickle and He does not hurry just because we are impatient. My dear lovely friends, sometimes we act like Mary and Martha. Also like my friend. When we are being pressed by so many problems we asked God to come very soon to help us. Even as time goes by, we feel God too long to respond or even we assume God does not answer our prayers. I said to my friend that our time is not His time and what will the future bring? just wait for the Lord. When our problem will end? Just wait for the Lord. God wants us waiting patiently so that His glory can be expressed in our lives. For God nothing is impossible and He is never too late. I said again that our problem may not go away tomorrow, but God has promise to always give us strength to overcome our problems. The pain may not diminish, but his grace neither will diminish. Just be patient, ask to God through prayer so that god gives us strength to be patient. Always put our eyes upon God’s promise, wrap our mind around this word: When we wait for the Lord courageously, He will strengthen our hearts. 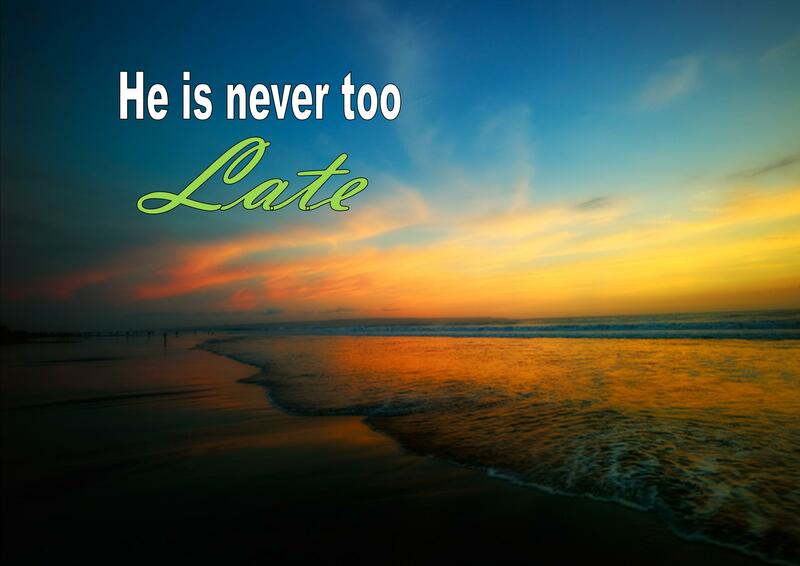 He is never too late and never insufficient. Not live with our own thoughts and own way because Isaiah said: “For my thoughts are not your thoughts, neither are your ways my ways,” declares the Lord. (Isaiah 55:8) Amen.